Nina B. Elkadi A platter from 5026, an Indian restaurant in Chapel Hill, North Carolina. As a Yelp Elite member, I was tasked with finding the restaurants, so we set out on a culinary tour of the South. For most of their marriage, my parents have lived in Iowa City, Iowa. They love every bit of its crunchy-granola yet Midwestern vibe, but this winter, Iowa City endured record-breaking cold temperatures. After 36 years, this was the final straw: they were finally ready to migrate South. This Spring Break, we took a trip to find a new, warmer home. There were two requirements: The city must have good food and warmer weather. As a Yelp Elite member, I was tasked with finding the restaurants, so we set out on a culinary tour of the South. "This looks like Greece!" my dad observed of St. Augustine, Fla.
"I thought you said Spain. It looks like Spain,” my mom countered. "Oh. Ok, yeah, but there's a gyro place!" St. Augustine was nice, but a bit touristy for my parents' taste: They didn't love the abundance of "someone from St. Augustine loves me!" stores. The saving grace was a great Polish diner. My mom, who was born in Poland, loved the borsch at Gaufre's and Goods. I ran into someone from Iowa on the street in Savannah. I guess it’s just that kind of place. At Kayak Kafe I didn’t check the Yelp photos thoroughly enough, so I ordered the wrong dish. But my parents ate hearty salads: tomatoes, shrimp, fancy cheese. For dessert, we got ice cream,but we had to stand in line for half an hour. Coming from Iowa, home to more cows than people, this seemed egregious. In Columbia, S.C., I didn’t even “check-in” at any restaurants on Yelp. Instead, I got a haircut that lasted maybe four minutes but cost $30, and I saw Beto O’Rourke speak about reconstruction and the history of the South. My parents will not be moving here. Charlotte, N.C., has a brewery scene so vibrant it almost made my parents consider moving there. However, my parents weren’t expecting Charlotte to be so big. They want to live somewhere they don’t have to drive much, and this didn’t seem possible in Charlotte. I fell asleep in the car ride to Chapel Hill, N.C., and if someone woke me up saying “we’re back in Iowa City!” I would have believed them. 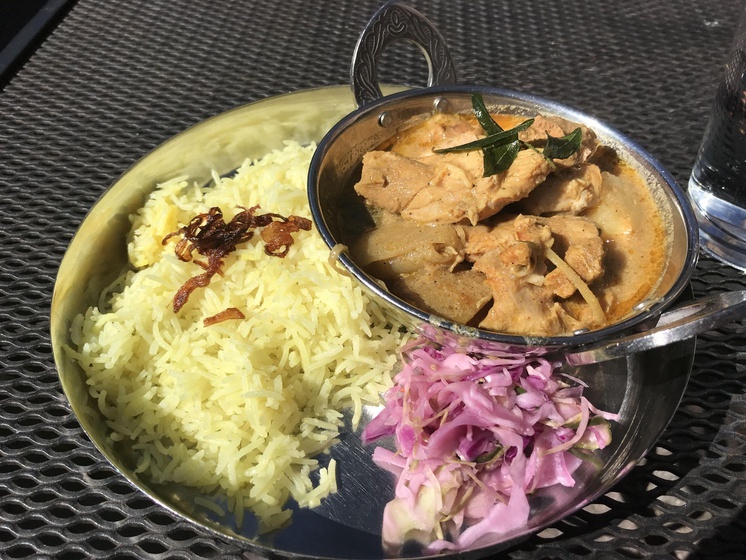 My mom and I enjoyed Indian food at Vimala’s Curryblossom Cafe, but my dad, a picky eater, didn’t find any food he liked in Chapel Hill. I had assumed my parents would end up in Savannah — which catered to everyone’s palates — but my mom just texted me that Wilmington, N.C.a is at the top of their list. I guess all they needed was a city without me?